Or can I buy the "full" version and use the alpha with that license? The registration key that you buy from the Google Play store will activate all versions of Poweramp, so download the store version first, then buy and install the key, then you can install whichever versions you like whenever you like, in including new releases from the site here and test versions. But you told me it worked before, right? In which version, which smartphone? This is really a weird bug! Thanks Andre, I didn't know this! I will buy the full version then and after that I'll test the alpha version thoroughly. i ve just installed the alpha version of power amp and still have the cover problem! So i dont know what can i do. It seems we are doomed to have no covers! I ve used power amp for 4 years and it was fine until the 6.0.0 updated, in fact it worked fine with the present phone until the 6 updated. I would like to add more information about all this, since it seems to be related to the smartphone model Nacho and me are using. Maybe this serves to get some clue as to what is failing so we can report the problem to the phone maker. Using alpha version or stable (build 582) version, if I long press the screen area where the cover should be to activate the downloader, I get what you can see in the attached image. 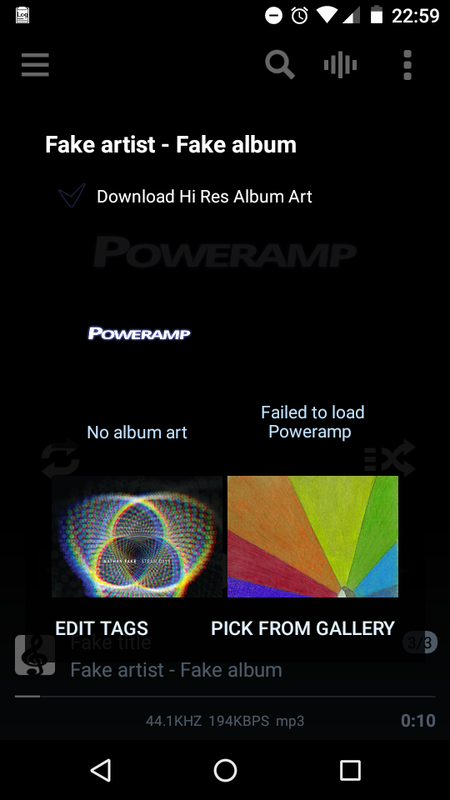 As you can see, it says "Failed to load Poweramp", which I don't know what means in this context: Poweramp failed to load some image? Some module? Some permission failed? It may not be related to this problem but I thought it was suspicious as all this starts to smell like related to some permission problem. The screenshot was taken using the alpha version, but the exact same happens with official version. I remembered it and that's why I took the screenshot, just in case. I tested another player (Neutron) which also does its own media library scanning (it doesn't use the Android Media Scanner library) and it properly shows the album art of my music library AND the album art contained in the test files I provided. So, even if this problem is a weird interaction between Poweramp and my particular terminal model, it's definitely a weird interaction not affecting other players. Neutron is not a bad player either, but the settings menu looks like it was designed by a psycho, no offence. Also, it's more expensive than Poweramp, so I would utterly love this issue fixed in Poweramp, because it's the one I will finally buy. Please, investigate the cause of the problem, I'm ready to help with the debugging: this shouldn't happen, it actually doesn't happen in any other player I've tried! Tried with latest public build and the beta. No album art shows at all despite it being embedded in the MP3 files. Have played about with various settings to no avail. Thanks kradcliffe, sounds like the same bug some other marshmallow users are reporting. Hi, I wanted to add my two cents in - I just upgraded to the Galaxy S7e as well and no longer have any album art. All my album art is embedded in the tags so there is no downloading - I don't download album art. My last phone was a Galaxy S6e where it works fine (Lollipop, not Marshmallow). On my GS7e, I have Android 6.0.1 and am running Poweramp build 584. The Samsung Music Player shows the album art fine. Just wanted to throw my hat in the ring. I have asked Max if he could look into this as it seems to be a fairly widespread issue. I want to reiterate that I'm ready to help with any testing if needed, no problem. Like others, I have also recently bought a Samsung S7 (not the Edge) and no longer have album art (which is painstakingly embedded in all MP3s). Previously I was using a S5 (lollipop) and it worked fine. I've logged a ticket for this as well (while I was waiting to be validated on the forum). I am happy to get involved with any testing if needed. As I pointed, looks like a weird interaction with SOME flavours of Android 6, since it works with a Nexus. My phone is part of the Android One program, so it has a Stock ROM, an Android as vanilla as possible, so the reason behind this problem is not some vendor modification, it happens in my ROM which is delivered directly by Google. DervishD, I didn't explain myself very well, visualisation are a good substitute, *until the issue is resolved* - I most definitely prefer album art. Particularly when driving when the visualisations would be way too distracting to use! Oh, I understood you point, my intention was not correcting you, I just wanted to say I prefer album art over any other on-screen content and I wanted to say it in a lighter mood. Not sure whether the album art fix referred to in build 585 (uploaded today) will resolve this issue, could someone with marshmallow check? Andre, as soon as the update gets into my phone (probably in a few hours) I will test and report anything. Thanks A LOT! Build 585 is available for download from http://forum.powerampapp.com/index.php?/topic/3189-poweramp-build-585-updated-15-mar-2016/ , I don't know if it's on Google Play yet. I'll wait for the Google Play version, even if it takes a couple of days. I'm just awaiting a firmware update on my phone and I don't want to activate the "Unknown sources" to install PA by hand right now. After the firmware update, I will be able to install it by hand or from Google Play, what happens first. I'll post any new in this thread. Cheers. Worth testing the existing 584 build with your new firmware first though, just to be sure to make a genuine test. Mmm, good point, Andre. I will do that, then. I first update the firmware, which should happen tonight or tomorrow, then will test my current 584 and after that I will install 585. Just wanted to add my 2 cents. Poweramp also doesn't show album artwork on my phone. It also has another semirelated issue with DVC, at least for bluetooth devices. DVC worked wonderfully on my S6 Edge before.